70 SMT Magazine • March 2017 temperature storage to maintain its activity, and warming up (generally more than four hours) is required prior to application to prevent its tem- perature from being incompatible with room temperature. When the temperature varies dra- matically, water drop will be generated on the surface of the solder paste, leading to splashing during high-temperature reflow. 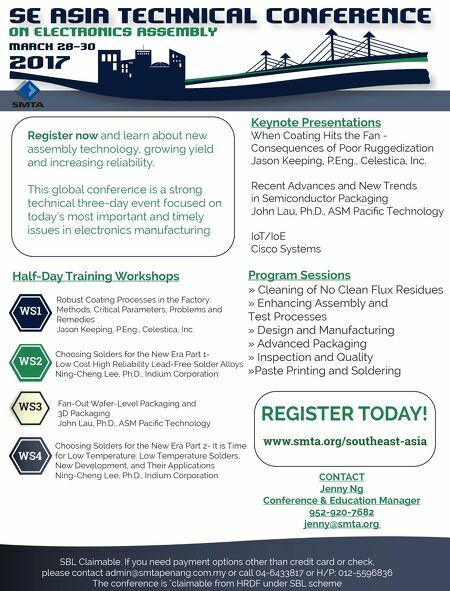 In addition, you should also consider issues such as how the solder paste applied in stencil will be processed, how the solder paste is timed, and how the solder paste that has been applied in original stencil will be administered and con- trolled when the stencil is modified. 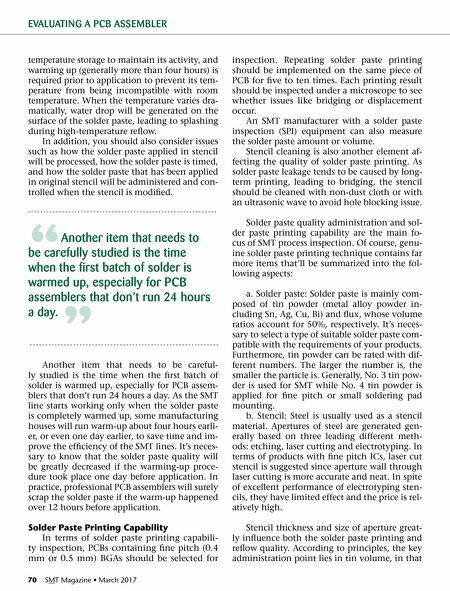 Another item that needs to be careful- ly studied is the time when the first batch of solder is warmed up, especially for PCB assem- blers that don't run 24 hours a day. As the SMT line starts working only when the solder paste is completely warmed up, some manufacturing houses will run warm-up about four hours earli- er, or even one day earlier, to save time and im- prove the efficiency of the SMT lines. It's neces- sary to know that the solder paste quality will be greatly decreased if the warming-up proce- dure took place one day before application. In practice, professional PCB assemblers will surely scrap the solder paste if the warm-up happened over 12 hours before application. Solder Paste Printing Capability In terms of solder paste printing capabili- ty inspection, PCBs containing fine pitch (0.4 mm or 0.5 mm) BGAs should be selected for inspection. Repeating solder paste printing should be implemented on the same piece of PCB for five to ten times. Each printing result should be inspected under a microscope to see whether issues like bridging or displacement occur. An SMT manufacturer with a solder paste inspection (SPI) equipment can also measure the solder paste amount or volume. Stencil cleaning is also another element af- fecting the quality of solder paste printing. As solder paste leakage tends to be caused by long- term printing, leading to bridging, the stencil should be cleaned with non-dust cloth or with an ultrasonic wave to avoid hole blocking issue. Solder paste quality administration and sol- der paste printing capability are the main fo- cus of SMT process inspection. Of course, genu- ine solder paste printing technique contains far more items that'll be summarized into the fol- lowing aspects: a. Solder paste: Solder paste is mainly com- posed of tin powder (metal alloy powder in- cluding Sn, Ag, Cu, Bi) and flux, whose volume ratios account for 50%, respectively. It's neces- sary to select a type of suitable solder paste com- patible with the requirements of your products. Furthermore, tin powder can be rated with dif- ferent numbers. The larger the number is, the smaller the particle is. Generally, No. 3 tin pow- der is used for SMT while No. 4 tin powder is applied for fine pitch or small soldering pad mounting. b. Stencil: Steel is usually used as a stencil material. Apertures of steel are generated gen- erally based on three leading different meth- ods: etching, laser cutting and electrotyping. In terms of products with fine pitch ICs, laser cut stencil is suggested since aperture wall through laser cutting is more accurate and neat. In spite of excellent performance of electrotyping sten- cils, they have limited effect and the price is rel- atively high. Stencil thickness and size of aperture great- ly influence both the solder paste printing and reflow quality. According to principles, the key administration point lies in tin volume, in that EVALUATING A PCB ASSEMBLER " Another item that needs to be carefully studied is the time when the first batch of solder is warmed up, especially for PCB assemblers that don't run 24 hours a day. " Column — One Size Fits All?